My kids love dying Easter Eggs, but with a little one, I don’t like using those chemical dyes or food colorings that stain clothes. We prefer to dye using natural dyes. They still have the power to stain (I highly recommend “junk” clothes), but the stains don’t set as badly and there is no fear of the littlest one drinking any. So what do we use to get our colors of the rainbow? Stir 2 tablespoons of paprika into 1 cup of boiling water. Then add 2 teaspoons of white vinegar. Simmer the skin of yellow onions in 1 cup of water for 15 minutes. Then add 3 teaspoons of white vinegar. Steep 4 or more bags of chamomile tea in 1 cup or boiling water. Once cooled, add 2 teaspoons of white vinegar. Simmer the skin of red onions in 1 cup of water for 15 minutes. Once cooled, add 3 teaspoons of white vinegar. Simmer blueberries in 1 cup of water for 5 minutes. Mix 1 cup of grape juice and 2 teaspoons of white vinegar. Mix 1 cup of pickled beet juice and 2 teaspoons of white vinegar. Mix 3 tablespoons of instant coffee into 1 cup of boiling water. Many people only choose to dye white eggs, but we’ve dyed all shades of our brown eggs and had some beautiful results. Medium browns dyed pink turn to a beautiful mauve. Brown eggs dyed green turn a nice sage color. For the bold colors, weigh the egg(s) down in the solution and leave overnight. Note: If you are soaking overnight, omit the vinegar until an hour before removing the eggs from the solution or the shells may become brittle. Better yet, find a local farmer who sells rainbow colored eggs and leave them au natural. We are blessed with some beautiful pinks, blues and green in our basket daily. Two companies that I know of, Natural Earth Paint and Eco-Kids, carry natural egg dye kits if you don’t have the supplies on hand to make your owns. What I like about both of these companies is that they keep it affordable (which is sometimes rare when it comes to natural alternatives). Make sure you swing by our Facebook Page and share your colorful baskets! 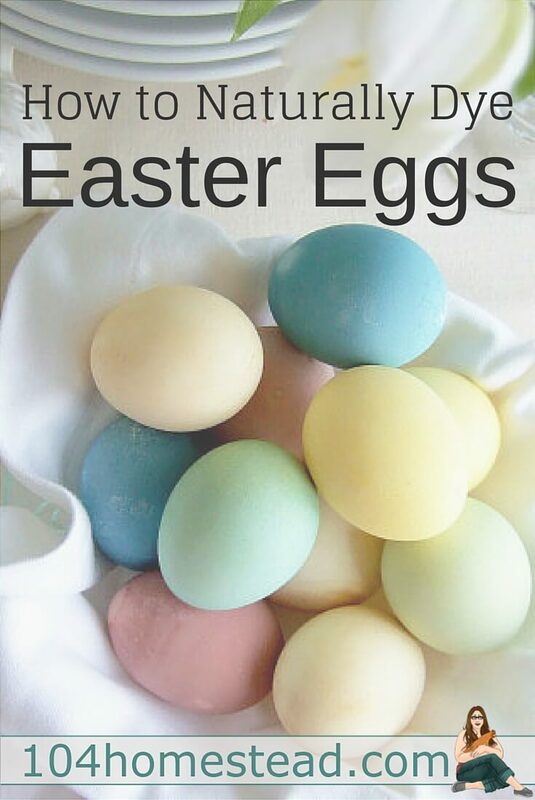 I have been looking for some more natural egg dye ideas. Thanks for the great list. We use black walnuts for dye. It makes things a really pretty brown color. Lovely colours, Jess. Naturally dyed eggs are my favorite. This is such an informative post , I did share. How do you farm on 1/4 acre? What restrictions do you face? I an still trying researching and would love to start with some chickens. I have a friend ( Janet , timber creek farm ) who has been kind enough to educate me about start up and care. Hi Wendy! I have a little writeup on my homestead located at https://104homestead.com/featured-homestead-jessicas-14-acre-in-maine/ that might interest you. I’ll be featuring a different homesteader each week to give people like yourself ideas and inspiration. This week I’m going to be featuring a homestead even smaller than mine. Be sure to check back every Friday (or subscribe and it will come right to your inbox). AWESOME!!!! Can’t wait to share!